“You’re evil, you’re evil, you’re evil”, Muppet sings while hugging, kissing and frolicking with her big sister while I’m setting the table for dinner. I smile; her words and actions are clearly contradictory, so she is not aware of the meaning. Such a sweet little toddler. Time to have the discussion about certain words we don’t use, I think to myself. “But Dad tells Kelly, my sister and me that you are evil. That we get the flea bites at your house and that you give Muppet the booty rash.” Sweet Bee says. How many target parents have heard similar words? How many target parents have felt the same feelings that were going through me? Countless, but even 1 person having to go through this is too many, even 1 child having to be subjected to this is too many. And it is not like I had not heard it before. During trial we entered into evidence and email from Ex to me where he calls my mother ‘the Devil’, because my mother held him accountable for not taking good emotional, physical and financial care of me and the kids. The pattern is only repeating itself, but now with me who is to be eliminated. 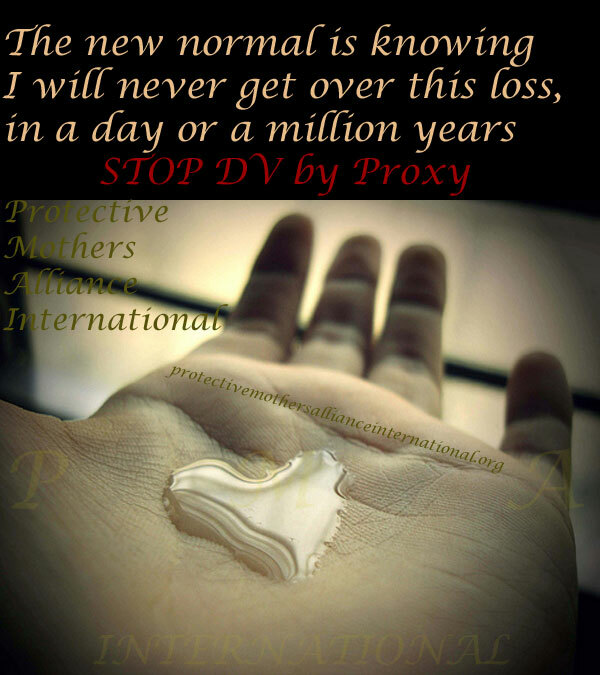 Parental Alienation is depriving a child from a valid loving relationship. It is about creating dependency on the alienating parent, not based on the truth and reality, but based upon subjectivity and persuasion. And that is the ‘hook’ Reunification Therapists take a hold of. They work with the child to teach them to ‘figure it out’, to learn to discern between fact/reality and subjective distortion. The Reunification Therapist works to improve mental functioning by working on reality testing and mitigate the trauma by weighing evidence. Most parents don’t know what a therapist does, but that doesn’t mean a parent can not do ‘supportive’ work while the therapist is not available. It is hard and can be difficult, but the parent has to calmly, objectively and non-emotionally clarify the reality which the child themselves can test. So what is the evidence in the statement of Sweet Bee? Ex has a ‘rat problem’, rats carry fleas. The kids return from access with numerous bites, documented by 3rd party. I have dogs who are religiously treated with K9 Advantix. The kids leave without flea bites. Muppet has been returned from access with a (bleeding) diaper rash multiple times, diagnosed and treated within hours by dr.’s. “Are you itchy right now?” I ask. “No” they answer. “Do you have any bug bites right now?” I continue. “No” they answer again. “When you are itchy and have bug bites where are you then?” “We’re at Dad’s, and he has no bug bite lotion” is the answer. They emphasize the lack of bug bite lotion. While that seems trivial, it is not. It means they (unconsciously) did a reality check. They had been looking or asking for bug bite lotion while at Dad’s. I didn’t lash out and said Ex was a liar to the children. I calmly did a reality check. While dealing with the bug bites was ‘easy’, internally I was trying to figure out how to bring up the diaper rash. The dr.’s diagnosed it as being the result of prolonged exposure to urine and it extends down her leg(s). It is not normal for a 3-year-old to have this when she is fully potty trained. The last episode likely had to do with the fact that Ex left the children unattended in a car for periods of time without supervision, access to food/water or bathroom. ‘Inadequate guardianship’ is what CPS supervisor called it. “Where does your booty hurt the most?” I ask Muppet. “In the front” she replies. Ok, good point, a good factual statement for a 3 ½ year old. “But when you are with Mom or with Dad?” I try to probe a little further. “Both” she innocently replies. And she is right, it is not like it is instantly over, and how am I going to explain to a toddler that it takes time to heal? How do I explain the cause and effect; prolonged exposure to urine = diaper rash? And this is why parental alienation takes ground with younger children so much easier than older kids, teenagers or adults. Younger kids don’t have the same conception of reality, developmentally they are not ready yet. They still believe in Santa. They’ll believe anything a parent tells them. Distorting reality for a child this young and depriving them from the other parents’ love, making them question the validity of this love is devastating and has long-lasting effects. It is cruel to the child. But parents with this attitude do not solve problems by being rational. They have no internal conflict, it doesn’t bother them they are hurting the child. If a problem arises, it is always someone else’s fault. Courts are supposed to uphold the statue of Best Interest of the Child. It should protect the child from the harmful effects of Parental Alienation, which is considered psychological child abuse in the DSM 5. Fighting parental alienation is not about a mother’s right, it is not about a father’s right, it is about the children’s right. They are not 2nd class citizens.